It was not a good quarter, and Alliance wants you to know what it's doing about it. Alliance Resource Partners (NASDAQ:ARLP) posted record volumes of coal produced and sold in 2015, but revenues fell and so did EBITDA. The problem? Falling coal prices have finally caught up to Alliance, which is why the partnership is taking steps to address the problem. Here's what you need to know. Alliance Resource Partners logo. Source: Alliance Resource Partners. Alliance has long been the cleanest shirt among the dirty laundry in coal. In fact, while other miners were trimming production and reporting shortfalls on the top and bottom lines, Alliance kept producing more coal and making more money -- until last year, anyway. Its volume increases had been more than enough to offset falling coal prices. A heavy focus on the Illinois Coal Basin was largely responsible for this standout performance. All of this is why CFO Brian Cantrell's summation was so disturbing: "As outlined in our releases this morning, while ARLP remained profitable and generated strong cash flow in 2015, reduced coal sales prices drove revenues, EBITDA, and net income lower in 2015 compared to 2014." This is a huge change for Alliance and is, perhaps, the first real test of the partnership. The next big change is the partnership's distribution. Through most of the coal downturn, Alliance upped its payment every quarter, which ended in the third quarter last year. And during the fourth-quarter conference call, CEO Joe Craft announced a continuation of the policy: "Alliance's Boards have elected to maintain current quarterly unit-holder distributions at $0.675 per unit at ARLP, and $0.96 per unit at AHGP." AHGP is Alliance Holdings GP (NASDAQ:AHGP), Alliance Resource Partners' publicly traded general partner. This alone, however, isn't the big news. It's the numbers that back up this decision. For example, in 2015 distribution coverage for Alliance was 1.6. For a limited partnership, that's a robust coverage number. But the CEO explained, "We expect ARLP's 2016 distributable cash flow to cover its current unit-holder distribution by 1.1 to 1.2 times." To be fair, that's still a solid number for an LP. But the coverage trend is clearly in the wrong direction. And that's why Alliance is making the right move by holding off on distribution hikes. It's better to be cautious than have to cut later. It's also why, according to Craft, Alliance is "shifting production to our lowest-cost mines and reducing unit shifts and production days to curtail production and bring our production volumes more in line with our contracted coal sales." In a difficult market, these are the right moves, no question about it. The goal is for the company's Illinois Basin mines to produce around 6.5 million fewer tons in 2016 than in 2015. The problem here is the implications one might draw about the coal market from this decision. No wonder Alliance's share price has been beaten down so hard over the last year or so. So how about that coal market? The thing is, Alliance didn't have anything good to say about the coal market. For example, the CEO noted: "Total annual production for the year was near 900 million tons for the first time since 1986. Fourth-quarter production was even worse at only 207 million tons, which puts it on an annual pace of about 828 million tons." So 2015 was the worst year for coal in roughly 29 years, and 2016 could be even worse than that. There's a host of reasons behind this, including low natural gas prices and environmental regulations. These have conspired to reduce demand and prices. Since natural gas remains at historically low levels and regulations look likely to become more stringent and not less, the outlook is pretty bleak. Investors, then, are right to be concerned. Especially when you look at the competition. Some of the country's largest coal miners have fallen into bankruptcy and follow Illinois Basin miner Foresight Energy LP (NYSE:FELP) is working with lenders after announcing it was in default on its revolving credit agreement. Positively, the banks and Foresight are still talking -- but the negative here is obvious. All of these negatives are why Craft explained, "Looking ahead, we continue to believe that ARLP can successfully navigate the current market and is well positioned to grow its production and cash flows as the market comes back into balance." The production cuts, cost-cutting efforts, and holding the line on the distribution are all a part of this. However, the partnership has another ace up its sleeve: It's producing less than capacity. In other words, when the coal market starts to recover, Alliance will be able to take advantage of the situation fairly quickly with its highly desirable Illinois Basin coal. Right now that's small consolation to investors who've seen the units fall by over 60% in a year. But when you compare Alliance with its peers, it's still the cleanest shirt in an increasingly filthy pile of laundry. 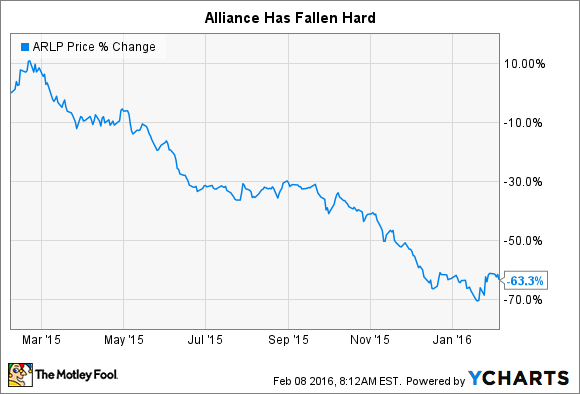 For contrarian investors, Alliance remains one of the best ways to play a coal rebound.